I learned to make handmade tortellini thanks to the grandmother of a friend of mine. The funny thing is that I met her in Dubai! She came from Bologna – the motherland of tortellini, ragù, and many other typical Italian recipes – with a rolling pin in her suitcase. This was her first flight ever! (Both meat and mortadella must be finely ground, if possible ask at your butcher to grind everything twice). – Sauté in a fry pan the meat (veal and loin) with olive oil for a few minutes. – Combine all ingredients in a mixer until the dough is smooth: veal ground, loin and mortadella, grated parmesan cheese and eggs. Add a sprinkling of nutmeg, and a pinch of salt according to your taste. – In a large bowl or on a work surface, combine all ingredients for the dough: 15 eggs and 1.5 kg of flour 00. Knead well with your hand until you get a smooth and uniform dough. – Divide the dough into 3-4 balls, cover them with a clean cloth to keep it from drying out, and start working the first ball with a rolling pin: rull it out until you have a sheet of paper-thin pasta. – Once stretched the dough, cut it in strips and then into small squares. – Place a small quantity of filling into the center of each square. – Fold the square into a triangle. Press tightly to seal. Place the base of the triangle on your finger and wrap the two corners around your finger with a slight pressure to seal (watch the video). 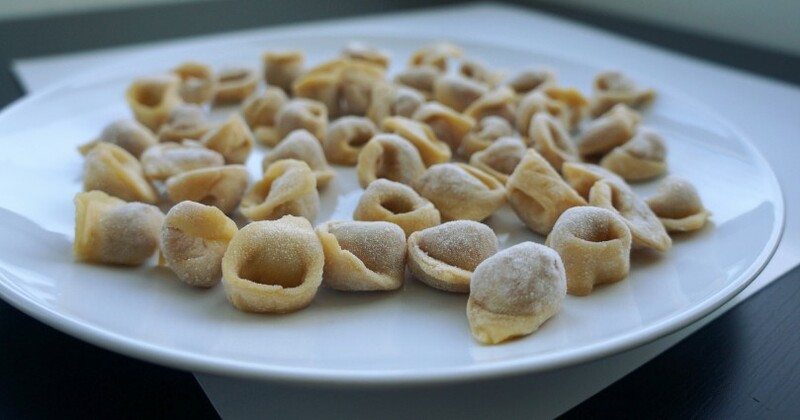 – Remove the tortellini from your finger and place it on a lightly floured tray. Repeat with remaining pieces of dough. – Cook the tortellini in the boiling meat broth (previously prepared) for 3 to 5 minutes, or until they float to the surface (the cooking time vary depending on the thickness of the sheet. Taste one to check for doneness). Tip: If you want to make tortellini for less people, it takes 1 kg of flour 00 for 10 eggs.